Bengal Cats are unlike any other feline you’ve had the pleasure of meeting. 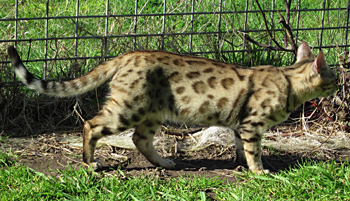 The Bengal Cat originated from a cross between the Asian Leopard Cat, Prionailurus bengalensis, and an Egyptian breed of domestic cat called the Mau. The aim was to produce a lovable house-pet with the looks of a leopard. The Asian Leopard Cat (ALC) is a small, solitary carnivore distributed from northern Afghanistan and Pakistan across much of India, Nepal and eastern China as far north as the Korean Peninsula and Russian Far East, and south through Myanmar, Vietnam, Thailand, Cambodia and Malaysia as far as Borneo and parts of Indonesia and the Philippines. Agile climbers, they inhabit tropical rainforests and subtropical deciduous and coniferous forests, and occur from sea level up to altitudes of over 3,000 metres. The first known bengal was seen in the London Zoo during the 1880s, yet it was not until the 1960s that cat breeders began experimenting with the concept of a creating a new breed. Initially, interest was limited to groups of passionate hobbyists, until around 1980, when the accepted ‘mother’ of the Bengal Cat, Jean Mill, commenced a serious breeding program designed to create a new breed of domestic cat. Mill seems to have been the first to cross ALCs with the naturally spotted Egyptian Mau. Other breeds are thought to have been used over time to enhance certain aspects of the Bengal breed, including Siamese and Burmese. Whilst there are no ALCs in Australia, the bengal breed has thrived. Eagerly being sought after for their amazing looks and inquisitive affectionate nature which is often referred to as more ‘dog-like’. A straight Bengal Cat x ALC is termed an ‘F1’. When an F1 cat is then mated back to another pure Bengal, their offspring is ‘F2’ … and so the process continues. The fourth generation (F4) is regarded as a pure Bengal, and thus, a domestic cat suitable for pet ownership (and import!). Most bengals availble now are ten – eleven generations pure bengal and a completely domesticated breed. 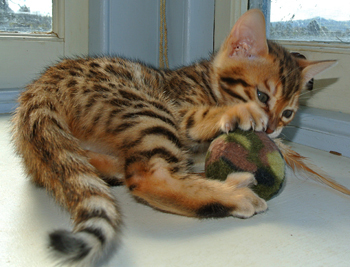 Bengal Cats have short, thick patterned coats made up of two or three colours. Two different types of pattern exist, known as ‘spotted’ and ‘marble’. Bicoloured Spotted Bengals have solid, dark spots on a paler coloured background, like a Cheetah… whilst Tricoloured Spotted Bengals have two-toned spots with a moderate coloured centre ringed by a dark outline, on a paler background, like a Leopard. These are called ‘rosettes‘, hence, these Bengals are often referred to as ‘rosetted’ rather than just ‘spotted’. Rosettes come in all shapes and sizes and everyone’s preferences vary… but, generally speaking, the bigger and funkier they are, the better! Rosetted Bengals are highly sought after due to their amazing looks. Spots/rosettes should be arranged roughly horizontally along the cat’s body, creating a feeling of lateral flow. Vertical lines (such as ‘rib bars’) or longitudinal arrangements of spots are undesirable. 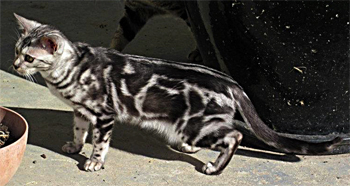 Bicoloured Marble Bengals have a dark, maze-like pattern over a paler background, whilst Tricoloured Marble Bengals have a third, darker colour outlining the pattern. The pattern may be open, with large swathes of background visible … or relatively closed, with only a little background peeking through: in which case the cat is called a ‘sheet marble’. 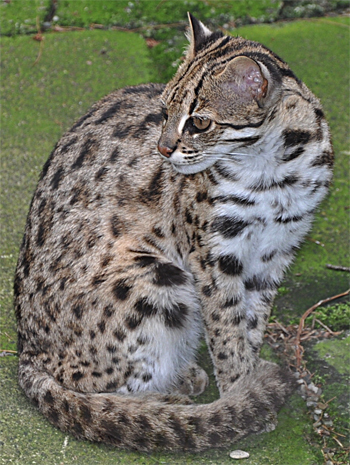 In any case, the visible areas of background usually widen as a Marbled cat approaches maturity, enhancing the contrast and beauty of the pattern over time. As with spotted Bengals, the marble pattern should flow horizontally along the cat’s body: vertical stripes or bullseye swirls are undesirable. Whether a Bengal is spotted, rosetted or marbled, its markings should be in stark contrast to the background colour, with sharply defined edges. The spaces between the markings should be ‘clean’: which means the paler background hairs should be one colour from root to tip, creating an even surface … rather than being ‘flecked’ or ‘ticked’ (dark tips on each hair), as commonly occurs in domestic tabby-cats. There are three main colours recognised in the Bengal: Brown, Silver and Snow; then there are a number of rare, ‘non-standard’ colours which occasionally appear, including Blue, Melanistic, Chocolate, Fawn, Lilac and Cinnamon. Broadly speaking, Brown Bengals have dark chocolate to black markings on a caramel or beige background, ranging along a spectrum from ‘hot’ to ‘cool’ tones. A ‘hot’ or rufous Brown Bengal coat looks rich and warm with an orange, Tiger-like tinge to it, whilst a ‘cool’ Brown Bengal lacks orange and is greyer, a little like a tabby-cat. Silver Bengals have black or dark grey markings on a white or pale grey background. The darker and sharper the markings and the paler and cleaner the background, the better! Snow Bengals come in three variations: Seal Lynx Point, Seal Mink or Seal Sepia. Seal Lynx Bengals are the palest of the three. Almost completely white at birth, their caramel pattern develops as they grow. Lynx cats are the only Bengals to retain their stunning icey blue eyes into adulthood. 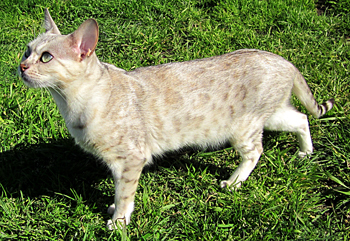 Seal Mink Bengals have milk chocolate markings on a warm creamy background; whilst Seal Sepia Bengals have dark chocolate markings on a similar creamy background. Seal Mink and Seal Sepia cats generally have deep hazel eyes beautifully complementing their coat. All three types of Snow Bengal have a dark seal-brown tail tip. Meanwhile, breeders are experimenting with Charcoal Bengals. Charcoal is not a colour in itself, but rather like a dramatic veil draped over any of the standard colours, darkening every hue. Glenparth plans to introduce a Charcoal bloodline in the future. Of the non-standard colours, Melanistic is perhaps the most fascinating. At first glance, these cats look completely black, but closer inspection reveals the typically striking Bengal pattern hiding beneath a semi-transparent smokescreen of black. A super-pale (preferably white), spotted tummy is an absolute must in a Bengal, along with a striped tail, and eyeliner to rival Cleopatra! White highlights surrounding the black eye liner are ideal, but not always common. Ideally, all Bengals should wear a ‘necklace’, being a solid dark line around the throat, or even better, a double line. 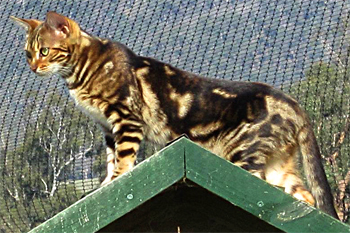 A wondrous feature unique to the Bengal is the prism-like sparkle of their glossy coats. In the sunlight, the ideal Bengal should glisten like its hairs were made of crystals. The Bengal should be rangey and muscular, with a long, strong neck, robust bone structure and a head which is longer than it is wide. The ears should be medium-small and rounded at the tip, and the eyes oval and large (but not at all ‘bugged’) and set far apart. The muzzle should be full and prominent beneath high cheek bones, with ‘puffy’ whisker pads and a large, slightly concave nose. The hind legs should be slightly longer than the forelegs, making the hindquarters higher than the shoulders. The tail should be relatively short and thick compared to many domestic breeds. Would you like to receive updates via email?